Meeting was called to order by Jen Denno, Co-Chair. The Cal ENA state board approved the charter that Al Duke wrote in 2018 to provide direction for the committee. Assembly member Rodriguez will be submitting a bill about violence against healthcare workers, bill number will be available soon. Cal ENA is a sponsor of the bill along with Cal ACEP. Jen met with CHA, the Cal ACEP lobbyist, and Rodriguez’ office to assist with bill writing. Other bills were discussed, there are already about 150 bills submitted for the new bill cycle in both houses. Legislation currently includes human trafficking, mental health, safety for EMS workers, and opioid abuse/misuse issues. Legislative Day will be March 6, 2019 at the Sacramento Sheraton. A Save the Date flyer was distributed, registration is now available on the website. Registration is required and the day will include breakfast, lunch, and CE. Other materials were distributed including the Washington report from National ENA from December 2018, list of new gun laws, and resources for following state legislation. Next committee meeting will be March 7, 2019 at 0900. In today’s meeting we discussed the bills from 2018 and their current state. We discussed how these bills that have passed in legislation will impact our Emergency Departments. There are several bills that worked through both legislative bodies that directly impact emergency nursing. The first bill that was highlighted was AB 3115. This bill would have removed the ENA’s ability to submit the nomination to the California EMS Commission. This bill was vetoed by Governor Brown. 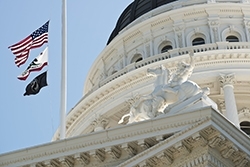 AB 2961 required the LEMSA to report offload times to the state EMSA. Finally, the group discussed SB 1152 which changes the requirements for the discharge of homeless from the hospitals including the ED. It was announced that Jen Denno will reprise the role of Chair for 2019. Jen has significant experience with the GAC and was the GAC Chair from 2015-2016. Last discussion refined and highlighted the GAC Charter. There was discussion and a motion to move the charter to the State Board for approval. In today’s GAC committee meeting we had a lively discussion about the current state of several pieces of legislation. August 6th marked the return of legislators back to the capitol with a short timeframe to move bills to their completion. With the deadline fast approaching for legislation to make it out of their respective houses, time is of the essence. A letter of opposition to AB 2961 (Ambulance Offload Time Reporting) was sent to the author of the bill and the appropriations committee. Committee will continue to track the bills progress and the outcome. More action may be required in the future. There was an intense discussion about SB 944 and the proposed change to the language of the bill. The committee recommended that a subcommittee be formed to develop strategies and options to assist with addressing these changes. More information will be coming about SB 944 as the subcommittee makes recommendations and a formal plan is developed. The GAC Committee is looking for a Chair for the 2019-2020. Please reach out to Al and Leslie Duke, or a member of the Board if you are interested in being considered for this position. Today’s committee meeting we discussed several existing and new bills. We reviewed the 9 assembly and 5 senate bills we have been watching this year. AB 1795, the alternate destination bill we have been supporting is in the committee on appropriation and we have sent off two more letters of support to show how broad the coalition is behind this bill. We had two robust conversations about a dialysis ballot measure and AB 2961 (emergency medical services), which is an act to add two sections to the Health and Safety code related to public health. AB 2961 would change the local definition of “nonstandard offload times” and could open the door to financial penalties for hospitals not meeting the standard. The committee and board have agreed to send a letter of opposition to the author of the bill and the appropriations committee. The dialysis ballot measure would prohibit dialysis clinics from discriminating or refusing services based on a patients payer and the centers would report specific information to the state regarding payment and cost associated with operations of the clinic. The committee and the board voted to keep a neutral stand. In today’s meeting, we discussed leg day which is on March 21st. Registration will go live on Cal ENA website within the next week. The registration deadline is February 28th and will max at 40 participants. This year we are going to do the hands only CPR training and include stroke awareness for the public after leg day is over. Discussion about this year’s charter and guidance for the committee so there is a plan of action for the remainder of the year and for the new legislative cycle in 2019. National level legislation HR 304 has been signed in December by President Trump to continue the practice of Standing Orders in EMS. HR 1478 is a piece of legislation that would provide for research on gun violence. The National ENA GAC submitted a letter of support based on the outcome of General Assembly in 2017. Please keep your eye on the California ENA website for the 2018 Leg Day registration form and sign up early. If you have any questions, please feel free to email CalENAGAC@gmail.com. The meeting was called to order today at 0915 by Al & Leslie Duke. The majority of the meeting focused on legislation working their way through both houses. There was interesting discussion on several bills and what affect each bill will have on patients, the emergency department and emergency nurses. The current watch list tops 23 bills with an additional 2 bills brought forward to the committee. The committee submitted a motion to move from a watch to support on AB 44 (Expedite workers comp in a declared disaster), AB 583 (Emergency Air Medical Transport Funding), and to oppose unless amended SB 746 (Student Health Physicals). The GAC committee referred two bills to the EMS committee for further discussion and recommendation as they pertain to Community Paramedicine. Cal ENA continues to support AB 909 (Emergency Response: Trauma Kits), which is scheduled for Assembly Appropriation Committee on May 17th. SB 20 (Seatbelt on charter bus requirement) has passed the Senate and is in the Assembly. Finally SB 799 (BRN Sunset legislation) set for hearing in the Senate Appropriations Committee on May 15th. The California GAC Committee hosted a cocktail party for legislators to come and meet the committee. This was a well-attended meet and greet, three members of the Assembly spent a considerable time discussing issues related to emergency nursing and healthcare. On March 8th 20 ENA members attended Legislation Day and spent the day learning about California legislature functions and the bill development process. There were 2 great guest speakers in the morning Tim Madden from the firm Randlett, Nelson, & Madden and Shanna Ezzell from Assembly Member Freddie Rodriguez’s office. The afternoon was spent touring the State Capitol and meeting with legislators. The afternoon following Leg Day, the GAC hosted a sidewalk CPR event in front of the Hyatt. Over the course of an hour 30 people were instructed in hands only CPR. The GAC would like to thank Kara Davis for coordinating the sidewalk CPR event and all the volunteers who came out to help in this community outreach. All of this wouldn’t be possible without the donation of the use of manikins from Laerdal Medical. We also wanted to thank Susan Smith for coordinating all the fantastic food, hotel rooms and meeting room logistics to make the day successful for all attendees. The Committee met on Thursday to discuss the introduced legislation for the new two-year cycle. The committee reviewed 17 Assembly bills, and 12 Senate bills. Here is the breakdown of the review: Assembly Bills: 17 AB Bills: 14 WATCH 2 REMOVE 1 SUPPORT- AB 882 Pupil Health Care Service: School Nurse Senate Bills 12 SB Bills: 3 REMOVE 1 OPPOSE – 2 SUPPORT- SB 20 Vehicle:Buses:Seatbelts SB 799 Board of Registered Nursing:sunset extension 1 WATCH with possible Support- SB 554 Nurse practitioners:independent practice 5 WATCH. The GAC committee had a great turnout. This meeting focused on the planning details for Leg Day in March 2017. Save the Dates are available; one correction to the Save the Date is the year. The month and day are correct, but the year was inadvertently recorded as 2016. Please note. This year’s Leg Day will start with a cocktail reception with Leg Aids on Tuesday March 7th from 6:00pm-8:00pm. Please come join us and meet your Leg Aid. The official Leg Day will be Wednesday March 8th from 8:00am to 4:00pm. There will be education in the morning, tour of the Capitol with legislator visits in the afternoon. Immediately following Leg Day, there will be a sidewalk CPR demonstration from 4:30pm to 5:30pm. Registration information and more details will be available next week (1/20/17) on the Californiaena.org website. If you are interested in participating in sidewalk CPR, please be sure to indicate that in the appropriate area on the form. Other topics discussed in our meeting were the newly introduced legislation for the 2017-2018 legislative cycle. Some areas of noted interest included National ENA Public Policy Agenda to be sure that we are monitoring legislation that is in line with National ENA. In addition, newly introduced legislation was included: AB 63- Provisional Drivers License, SB 20 which requires the use of seatbelts on private-chartered buses and SB 17- Notification of pricing increases for prescription medication. We discussed the California BRN strategic agenda. The BRN is searching for legislators to sponsor legislation on several regulation changes including a change to the CRNE program and the submission of malpractice settlement and arbitration reporting. At Cal ENA State Meetings, the GAC meets at 9:00. Chapters are encouraged to send a representative to the meeting. You can find both the Assembly and the Senate bills on this page. You can also subscribe to a bill to get an update on when it is being heard, in what committee and any changes in the language. Status: When a bill goes to APPR (Appropriations Committee), –that indicates the program requires more than $150,000 in funding. Watch – Indicates Cal ENA doesn’t have a position and will continue to watch the bill. Support – Indicates Cal ENA supports the bill in its present form. Oppose unless amended – means CalENA would oppose the bill unless changes were made (letters should include requested amendments). State Concerns – Express concerns and maybe provide language to eliminate Cal ENA concern.